I recently answered a whole lot of questions about swimming with Hawaii’s manta rays. I hope those answers have helped to ease some of your fears and hesitations. There was one question though that I struggled with. After typing way too many paragraphs for a Q&A type post I realized that this question warranted a whole separate article. So here we are. You’re no longer afraid of the swim and are just debating which option to book. Snorkeling vs scuba diving. Which is the best way to see Hawaii’s manta rays? While both of these are great ways to get out and explore the underwater world, they certainly have their differences. Let’s start by looking at a basic comparison of snorkeling vs scuba diving in general. Snorkeling is great for beginners. Pretty much anyone who is comfortable swimming can learn to snorkel. It is often done in shallow water or water with good visibility. Snorkeling can be very inexpensive. All you need is a mask and snorkel, although flippers can also be helpful. Since there isn’t much gear that is necessary, snorkelers can enter the water very quickly either from a boat or from the shore. 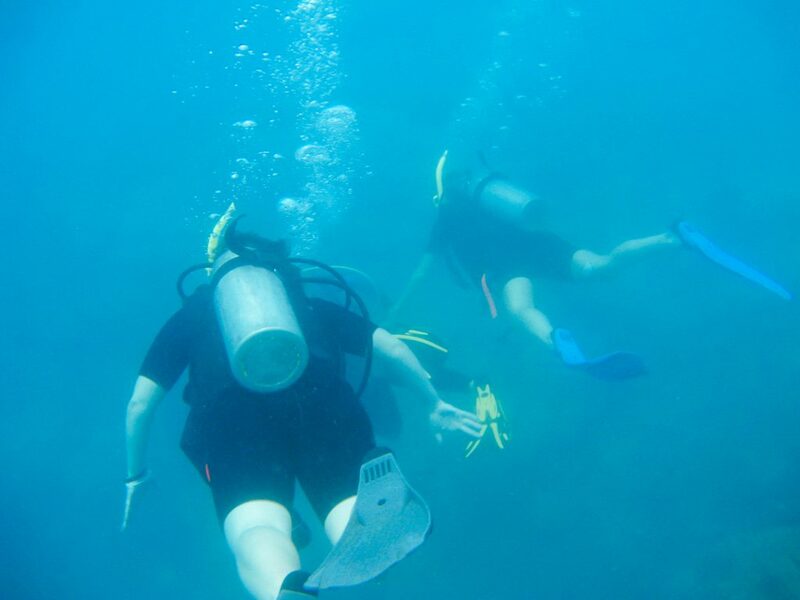 Most people who are healthy enough to travel are healthy enough to snorkel safely. Scuba diving usually* requires extensive training including classroom study, written exams, and practical exams before becoming certified. There is a lot of gear required for scuba diving, and that gear must be properly cared for and maintained for safe use. Therefore, the costs associated with scuba diving are much higher than snorkeling. Additionally, there are many medical conditions that must be considered. Some may prevent you from diving and others require a doctor signature prior to diving. That might sound like a long list of negatives but scuba certainly has it’s advantages as well. Scuba diving allows you to fully immerse yourself into the under water world. Instead of looking down on a school of fish, you might find yourself swimming right through them. You can get much closer to the coral and underwater creatures which will improve your experience (and your pictures). There are also many places that advanced scuba divers can explore that snorkelers will never get a chance to see. Some of these places include caves and deep areas not visible from the surface. 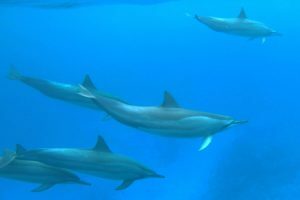 For these reasons, scuba is often perceived as more daring and adventurous. Which Is The Best Way To See Hawaii’s Manta Rays? I’ve been scuba diving before, but I have asthma so my doctor doesn’t love when I do it. I was just getting over a cold the week before my trip to Kona which was affecting my asthma. This made my decision easy, I was going to be snorkeling on this trip. I was worried though that I’d be missing out. Anything written about this experience calls night “diving” the must do experience. Not night “snorkeling”. Well fellow snorkelers, fear not. 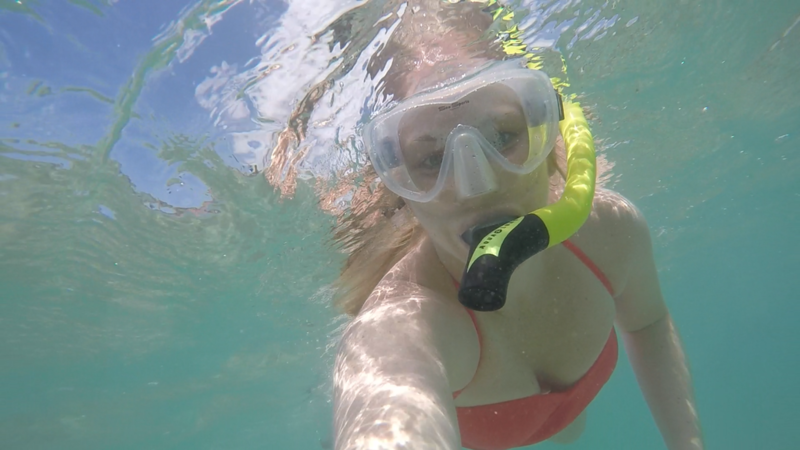 My experience was in no way diminished by the fact that I was snorkeling instead of diving. In fact, I think I had a better experience than the divers on that particular night. Before it was even dark out our captain excitedly pointed out a manta near our boat and told us to get in. We weren’t waiting until it got dark, we were waiting until we saw mantas and they were here. As mentioned in the overview above, it is a lot quicker and easier for a group of snorkelers to get into the water than a group of divers. We had less equipment on and didn’t have to slowly descend to the bottom. We were one of the first groups in the water and so the manta hung out with us, giving us a private show, for about 15 minutes before it moved on to another group. Not every group of snorkelers, even on the same night and location that I went, had the same experience. 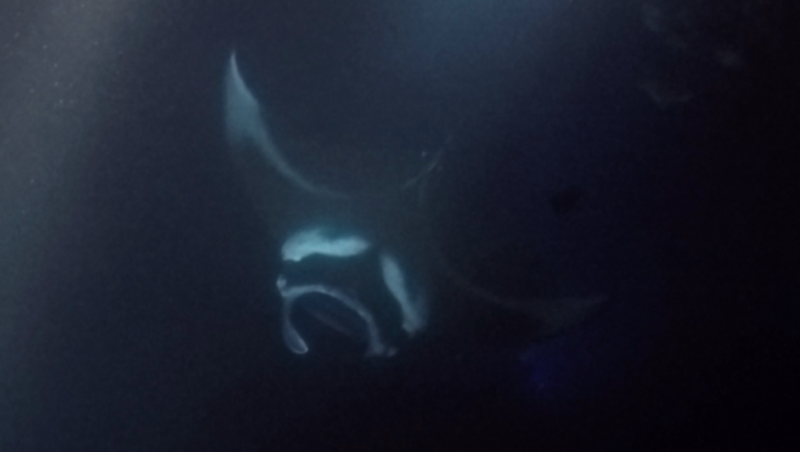 We just got lucky that this manta spent so much time feeding under our group’s lights. Around 0:32 in the video you can see the blue lights at the bottom of the ocean which are from all of the scuba divers that night. If you watch closely you can see a couple of times (0:40 – top left, 1:50 – bright blue light in the middle) when the lights seem to flicker as mantas pass over the divers heads. The mantas didn’t just stay on the surface with the snorkelers, they went down to visit the divers as well. In most instances I would concede that scuba divers get a “better” experience when exploring an underwater area, but I don’t know that the same applies for the Kona mantas. The mantas are attracted to the plankton around your lights. It doesn’t matter if those lights are on the surface of the water with the snorkelers or on the bottom of the ocean with the divers, the mantas just want to eat. 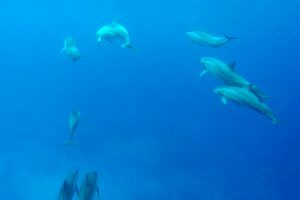 Unlike most snorkeling or scuba adventures, the swimmers are mostly staying in a group and floating on the surface (snorkelers) or sitting on the floor (divers). 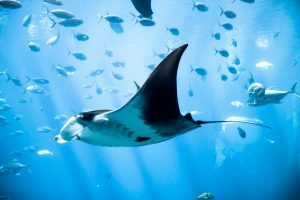 For the safety of the mantas, neither group is encouraged to swim towards the mantas. Either way you are hoping that mantas show up that night and that at least one manta chooses to come eat the plankton gathering around your giant underwater flashlight. If Both Have The Same Chance Of Seeing Mantas, Which Should I Choose? The choice will be different depending on your own personal circumstances, but here is a quick list of considerations to help you choose. Scuba tours cost more, mostly due to the gear rental and maintenance issues discussed above. You don’t have to be certified. Your group can get into the water more quickly than scuba groups once mantas are spotted in the area. There are some health concerns that may preclude you from scuba diving or becoming scuba certified. The waves were pretty rough on the night of my manta snorkel. Although no one in my tour group became physically ill, some were clearly queasy by the end. I wouldn’t say that I was sea sick, but I was a bit jealous of the divers calmly sitting on the ocean floor. It takes guts to get into the dark ocean at night regardless of which option you choose, but I’d say sitting on the dark ocean floor in the middle of the night takes more courage than swimming on the surface about 100ft from the boat. I sincerely hope that you enjoy a manta filled evening, regardless of which option you choose. Let me know in the comment section below whether snorkeling or scuba diving was right for you. Did you see any mantas on your trip? How close did they get to you? I can’t wait to hear about it!